Our pets mimic us in so many ways that it is not surprising that they copy our number one controllable health risk---obesity. To find out more information on how additional weight affects the life of our pets, click here. We are never ready to say goodbye to our beloved pet. When that time arrives, it is important that your family has the chance to say a final goodbye. 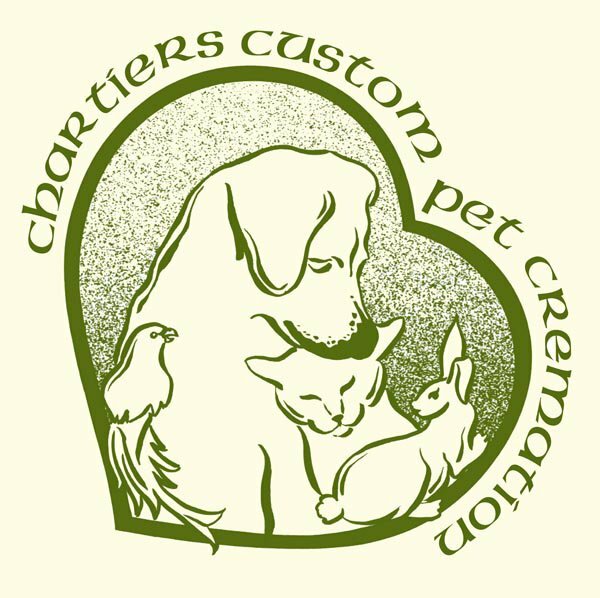 Chartiers Custom Pet Cremation helps ease this difficult transition by offering a time for you and your family to say one special and final farewell to your precious pet. The peaceful environment created by soft music and a soothing waterfall provide for a comfortable atmosphere for you and your family. This time spent with your companion often helps bring comfort during such a sad and difficult time and can often help to mend a broken heart. As summer approaches and you are enjoying beautiful blooms in your flower bed and the smell of a freshly mowed lawn, you may be reminded of your beloved pet who used to love to frolic in the sunbeams. You may begin to think, "How can I pay tribute to my precious companion?" These Stone Markers may be just the perfect memorial. 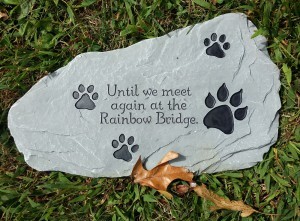 A memorial stone is perfect to place in a garden in remembrance of your beloved companion. It can be placed atop a buried cremains or used to mark the final resting place of a .family pet who was buried long ago. You may also like to see it surrounded by your flowers, simply as a sentimental reminder of a loved one who has passed. Made of resin and measuring approximately 14”X 8”, this memorial will be a loving tribute to your furry friend. Available in either “Until we meet again at the Rainbow Bridge.”(as pictured above) or “Best friends come in all breeds, and forever hold a place in your heart” (not pictured).